Our foster program gives us the opportunity to save more pets in our community and is integral part of what we do. You can foster for as little as 24 hours or on a longer term basis (based on your comfort level). We provide all veterinary care and can provide food, toys, and other supplies if needed. If you are interested in fostering one of Great Plains SPCA’s pets in need, please download our foster application and email it to foster@greatplainsspca.org. Help us spread the word about fostering! Download our foster flyer! Great Plains SPCA’s Behavior and Training Program works to keep pets in forever homes and prepare homeless pets for adoption. The behavior and training program adds tremendous value to the community and Great Plains SPCA’s lifesaving mission through public classes, staff and volunteer training, enrichment programs for shelter residents, and behavioral support to adopted dogs and their new pet parents. Can old dogs learn new tricks? How do young dogs learn manners? If you are in need of training help, come to Great Plains! We have openings in both our Basic and Advanced training classes beginning NEXT WEEK! All of our classes occur once a week and last for 6 weeks. Both Basic and Advanced classes are $200, but our Alumni Pups get a discount! Our Basic level classes are offered either Wednesdays or Fridays from 6pm-7pm . These classes cover sit, down, shake, stay, leash manners, not jumping up, sharing toys and treats and a variety of other behaviors! Our Advanced classes are offered Monday evenings from 6-7pm and will build off of the behaviors learned in Basic to expand duration of stays, improve leash manners to cover turning right and left as well as heel, place, and fun things like roll over and spin. K.I.S.S. Dog Training Class Sessions held at the Merriam Campus are held on Tuesdays and Thursdays. *Please note, public classes for our Merriam Campus are coordinated through K.I.S.S. Dog Training. Registrations will also be processed under this name. K.I.S.S. Dog Training DOES NOT honor GPSPCA Alumni Discount. Just as there are food pantries for families who need a hand up, there are food pantries for pets whose owners love them but need a little extra assistance with their food costs. We proudly distribute thousands of pounds of food every month to local families! To learn how the Pet Food Pantry can assist you with supplementing pet food for your furry family member(s), please call 913-808-2872 or email petfood.kc@gmail.com. Due to overwhelming demand, please allow up to 48 hours for a response. If you are submitting or have submitted an application, please allow up to two weeks for review and processing. The Pet Food Pantry relies solely on the generosity of the public to keep it stocked. Donations of unopened food can be dropped off during our regular business hours at our Merriam, Kansas or Independence, Missouri locations. You may also donate online from our Amazon Wish List. 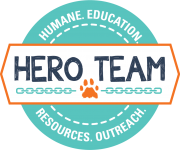 Our HERO (HumaneEducation Resources Outreach) Team is a distinct program in the Kansas City Metro that works to improve communities through education and outreach. With a humane, non-judgmental approach and the proper resources, our team is committed to helping improve the lives of the pets and the people who love them in our community. We have seen virtually every situation, whether it is an outside dog living year-round without proper shelter; a pet owner who loves their pet, but cannot afford to buy pet food, or community cats who need to be spayed or neutered. Many of the animals served through this program have owners with limited financial resources – yet many have huge hearts. With a little education on how to better meet the needs of their pets, and the importance of spaying and neutering, we have been able to turn some “less than ideal” situations into success stories. Through education and advocacy our team strives to build awareness, address community concerns, and help reduce pet overpopulation. A list of local animal control offices. A list of local animal shelters. Articles for common behavior concerns. A list of local wildlife rescue groups.